A freshwater zebrafish costs less than two bucks at the pet store, but it can do something priceless: Its spinal cord can heal completely after being severed, a paralyzing and often fatal injury for humans. 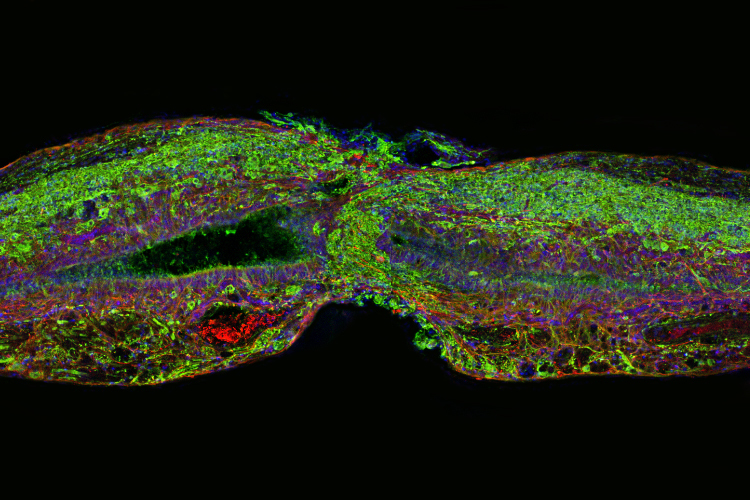 When the zebrafish’s severed spinal cord undergoes regeneration, a bridge forms, literally. The first cells extend projections into a distance tens of times their own length and connect across a wide gulf of the injury. Nerve cells follow. By 8 weeks, new nerve tissue has filled the gap and the animals have fully reversed their severe paralysis. “We were surprised that it was expressed in only a fraction of glial cells after the injury. We thought that these glial cells and this gene must be important,” said lead author Mayssa Mokalled, a postdoctoral fellow in Poss’s group. Indeed, when they tried deleting CTGF genetically, those fish failed to regenerate. “The fish go from paralyzed to swimming in the tank. The effect of the protein is striking,” Mokalled said. CTGF is a large protein, made of four smaller parts, and it has more than one function. But the second half of the CTGF protein seems to be the key to the healing, the group found. That might make it easier to deliver and more specific as a therapy for spinal injuries. Poss said that unfortunately, CTGF is probably not sufficient on its own for people to regenerate their own spinal cords. Healing is more complex in mammals, in part because scar tissue forms around the injury. Poss’s group expects studies of CTGF to move into mammals like mice. The group also plans to follow up on other proteins secreted after injury that were identified in their initial search, which may provide additional hints into the zebrafish’s secrets of regeneration. “I don’t think CTGF is the complete answer, but it’s a great thing to have in hand to inform new ways to think about the real challenge of trying to improve regeneration,” Poss said. Story from Duke University. Original piece written by Kelly Rae Chi. Please note: The content above may have been edited to ensure it is in keeping with Technology Networks’ style and length guidelines.